Blasting through your speakers with riffage of AC/DC-level intensity, Thunderbird's new album Heavyweight opens with the aggressive "Run For The Border." Vocalist Marc LaFrance takes the reins from the get-go with his gritty, metallic delivery, evoking a sound and style not entirely unlike that of Krokus frontman Marc Storace. 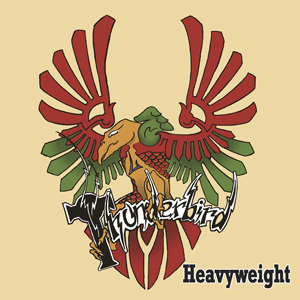 Thunderbird churns out arrangements harkening back to the heavier rock acts of the late 70s and early 80s. The guitar is chunky and virtuosic, the drums thunderous with machine-gun-like fills, and there is no lack of quintessential 1/2-time pre-choruses and breakdowns. Having contributed to wildly successful albums by Mötley Crüe, Bon Jovi, Cher, and many more, LaFrance is no stranger to singing hooks that sell. Thunderbird doesn't seem to follow the songwriting tendencies of those artists, however, remaining more raw, down, and dirty. "Big Stick" brings on pounding verses and choruses that rival the grind of Udo and Accept, but then sprinkles them with guitarist Rod Coogan's Vai-like playful guitar wails. "Go" does just that, speeding along at a blistering clip, while "Baton Rouge" dances along with a more head-bobbing bluesy gait. Breaking away entirely from the feel of much of the rest of Heavyweight, "This Sea" lands somewhere in the neighborhood of a prog-jazz ballad. Heavyweight is now available at all fine musical retailers: Amazon, iTunes, Spotify, CDBaby, and is brought to you by the fine folks at Delinquent Records.